515 min. ABC. Directors: Steven Levitan, Bryan Cranston, Fred Savage, Jason Winer, Michael Spiller, Chris Koch, Scott Ellis, Gail Mancuso, James Bagdonas. Cast: Ed O'Neill, Sofia Vergara, Julie Bowen, Ty Burrell, Jesse Tyler Ferguson, Eric Stonestreet, Sarah Hyland, Ariel Winter, Nolan Gould, Rico Rodriguez, Aubrey Anderson-Emmons, David Cross, Benjamin Bratt, Greg Kinnear, Leslie Mann, Ellen Barkin, Bobby Cannavale, Tim Blake Nelson, Justin Kirk, Kevin Hart, Philip Baker Hall, Chazz Palminteri, Jennifer Tilly, Josh Gad. Future sitcom hall-of-famer Modern Family isn't perfect. It is, perhaps, an easier show to like than to love. And yet it's a highly skillful blend of sitcoms old and new. While fully embracing the single-camera and mockumentary trends that have all but taken over modern sitcoms, the show hearkens back to the kind of snugly-fitted farcical plotting and traditional sitcom writing (genuinely clever joke construction and running gags) of shows like Cheers and Frasier. With a broadly appealing family-comedy premise—for those willing to accept gay parentage, that is—and a winning cast, Modern Family looks to remain a blockbuster network hit for years to come. Modern Family's greatest claim to ambition was in its 2009 pilot episode, which cleverly baited the audience into believing they were seeing a mockumentary sitcom about three diverse family units: sixtysomething Jay Pritchett (Ed O'Neill), Colombian "trophy wife" Gloria (Sofía Vergara), and son Manny (Rico Rodriguez); type-A Claire Dunphy (Julie Bowen), wannabe-"cool dad" husband Phil (Ty Burrell), and kids Haley (Sarah Hyland), Alex (Ariel Winter), and Luke (Nolan Gould); and gay parents Mitchell (Jesse Tyler Ferguson) and Cameron (Eric Stonestreet), the former fussy and the latter flamboyant. The narrative punchline to the episode revealed that all of the above constituted a single "modern family," with Claire and Mitchell being Jay's children. Now, in the show's third season, Mitchell and Cameron's Vietnamese baby Lily has been recast to be the walking, talking Aubrey Anderson-Emmons, and plans are afoot to adopt her baby brother. Meanwhile, Claire's frustration with city government (over a desired neighborhood stop sign) prompts her to run for city council, against incumbent Duane Bailey (David Cross, who appears in three episodes). In family-sitcom tradition, the whole clan goes on vacation, the season opener "Dude Ranch" taking place at a big-country Wyoming tourist trap run by a drawling Tim Blake Nelson (O Brother, Where Art Thou? ); later in the season, the family takes "Disneyland." Since Disney is ABC's corporate parent, that's a pretty blatant brand placement, but somehow not so glaring as the episode with a whole subplot devoted to Claire and Haley shopping at a certain franchise discount retail store. That episode, "Express Christmas," otherwise shows the series at close to its best, with a high-concept plot (preparing Christmas, in a few hours, on Dec. 16, since the family can work out no other day to celebrate together) and mix-and-match approach to the cast. Better yet is the Thanksgiving episode, "Punkin Chunkin," which finds a fresh thematic focus—dividing the family into the "Dreamers" and the "Pritchetts"—and masterfully weaves its plot threads into a cohesive and funny whole (in little more than twenty minutes). As a top-rated sitcom, Modern Family is also where industry "cool kids" come to play: Season Three guest stars include Greg Kinnear, Benjamin Bratt, Ellen Barkin, Bobby Cannavale, Leslie Mann, Justin Kirk, Kevin Hart, Philip Baker Hall, Chazz Palminteri, Jennifer Tilly, Barry Corbin, Samm Levine, and Josh Gad. No one will ever laud Modern Family for its subtlety, especially given the "theatrical hand gestures" of Stonestreet's Cameron, and the latter-day Charo routine that is Vergara's Gloria. And the show's modernism has been challenged in that it doesn't represent for mothers with careers outside the home (Claire's election bid offers something of a corrective there) and does represent for standard-of-beauty archetypes and the notion that women, especially girls, can't comfortably wear their intellect (an issue between Haley and Alex). Still, Modern Family makes some effort to meet American families where they live: doing their best, despite hectic lifestyles and differences of opinion, to live in harmony. 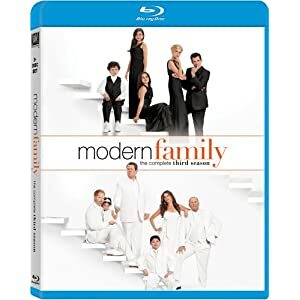 Fox sends home Modern Family: The Complete Third Season in a Blu-ray set consistent with its predecessors. The hi-def video quality, from digital masters, impresses in all categories: handsome contrast contributes to a general bright-and-tight crispness, detail is strong, and colors are warm and true. The lossless DTS-HD Master Audio 5.1 surround mixes prioritize crystal-clear dialogue, so there's not a lot of rear-channel activity (there's a bit of ambience in bustling settings), but for a sitcom, the audio treatment is certainly top-notch. Disc One adds value with "Deleted and Alternate Scenes" (6:29, HD); featurette "Destination: Wyoming" (9:43, HD), about the filming of "Dude Ranch," with executive producer Steven Levitan, Eric Stonestreet, Jackson Hole Mayor Mark Barron, director Jason Winer, executive producer Brad Walsh, executive producer Paul Corrigan, Reid Ewing, Matthew Gumley, and Ariel Winter; "A Day on the Set with Ty" (5:38, HD) with Ty Burrell, Winter, Julie Bowen, and director Bryan Cranston; and "Adventures of the Modern Family Kids" (3:35, HD) with the gaggle having fun in and around Jackson Hole, Wyoming. Disc Two likewise serves up "Deleted and Alternate Scenes" (8:56, HD), along with "A Modern Family Christmas" (5:59, HD) with director Michael Spiller, Rico Rodriguez, special effects man Tom Mertz; "Driving Lessons" (2:55, HD) with Rodriguez and Nolan Gould; "Ed O'Neill Gets a Star" (16:46, HD) O'Neill, Hollywood Chamber of Commerce President & CEO Leron Gubler, Levitan, Katey Sagal, Sofia Vergara, and council member Tom LaBonge. Disc Three includes "Deleted and Alternate Scenes" (7:14, HD); "Modern Family Goes to Disneyland Resort" (3:11, HD) with Levitan, Winter, Rodriguez, Gould, Stonestreet, and Ewing; and "Gag Reel" (8:56, HD). All site content © 2000-2019 Peter Canavese. Page generated at 04/17/2019 04:39:53PM.